NEY is pleased to introduce the latest addition to its machinery portfolio of a new family of machines from Italian manufacturer TOP srl. They specialise in Vertical Through-feed Solutions for Drilling, Routing, Grooving and Insertion of Dowel Pins, Construction Fittings. 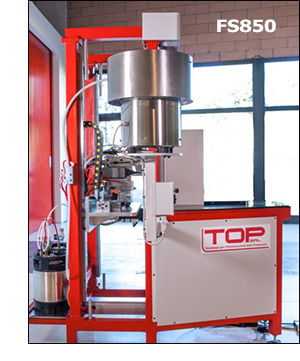 As well as a standard range of machines, TOP srl will also produce on demand special purpose machinery to suit a customer’s specific requirements. The model shown is the FS850, the smallest machine in the range, but still built to the same high standards as the larger more complex machines. Essentially the machine is a Vertical Drill, Glue and Dowel Insertion Machine, but with the addition of an offset drill head. Our current stock machine has been set for Cam and Pin Drilling, on 2 panels in one setting. The machine has a max panel length of 1600mm (optional 3000mm), max panel height of 850mm and a workable panel thickness of 8-50mm. If your requirement is for higher panels then TOP srl offer the FS1400. Control software is Albatros, running parametric CAD 3D TPAEdi32 on a Windows 7 operating system. With their flexibility in machine specifications and their experience with software regarding interface, automation and production optimisation TOPsrl are able to offer a complete solution based on your requirements.